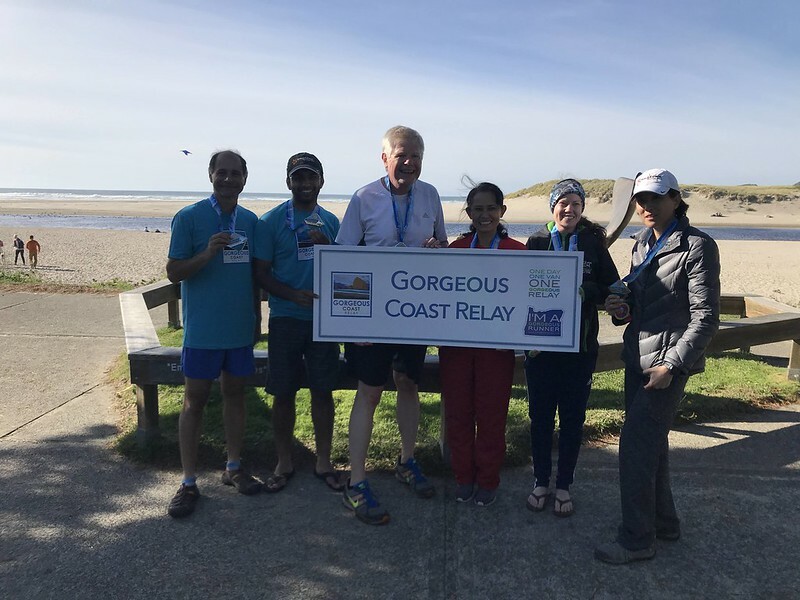 The 2018 Gorgeous Coast Relay was run on October 6 starting in Astoria. The Run Oregon team was made up of a group of friends who has done a number of relays together, but never a one-day relay. Read about their thoughts on Legs 1-6 here, and below for the final six legs. Leg 7 – 5.31 miles – Warrenton – (Sachleen) My second leg, leg 7, was a bit longer at 5.3 miles with a mix of road and trail running. I especially liked running through the fields on the single track path with cows sitting on one side. We had to zig-zag though narrow U shaped channels (I assume to keep the animals from escaping) that were scattered throughout the route. It was nice to mix things up after running on a road. I spoke with some runners who had never run trail before and they loved it as well. It was a relatively easy trail, packed dirt with no rocks or roots to trip on. I, along with a handful of other runners, did get confused and lost on the route, however. A volunteer directed us off the road and onto the paved path, but we did not see the small orange ribbon indicating the route left the paved path and continued on the small dirt path. For me, this oversight lead me to run out a half a mile on the other side of the highway and back before I met others who were checking their phones for the map. Once we figured it out, we ran back to the path and got back on the route. I had seen on my leg 1 the race had larger cardboard signs with arrows for some confusing turns, this would be a good place to add one of those signs to keep people on track. Leg 8 – 3.96 miles – Warrenton – (Helen) Leg 8 is a 4 mile beach run. I was kind of stressing about running all-out in the sand. For myself and the 2 runners who started with me, there was definitely some stumbling and flopping around initially, trying to find footing where one could maintain a reasonable pace. After I found my position, I totally loved it. Leg 9 – 4.05 miles – Seaside – (Koung) Out of the two legs I ran in this relay, this was the tougher one. After the exchange, we ran back out towards the beach where the Leg 8 runners had just come from. The sun was out, the ocean was beautiful, and I was about to run South along the shore. The first mile and a half are all on the sand as you run along the Pacific Ocean. This was definitely a Gorgeous experience to say the least. I continued on until I reached a sign that directed me up to the local neighborhood and along a small stretch of highway. My legs were glad to be out of running in the sand but sad that my ocean running leg was nearly over. A little more, and then at four miles into my leg I could see the few cars that had gathered at the next exchange. I ran it in to meet my next teammate. Boy, after that, my legs were ready for a break and I could not wait to cheer on the other runners on my team. Leg 10 – 3.46 miles – Seaside – (Shannon) Leg 10 takes the runner along the promenade in Seaside. It was fun to run with beautiful views of the coast and the cool ocean breeze, without having to deal with the sand that Legs 8 and 9 had to deal with. Walking along the promenade is always fun, but running along the promenade brought some unexpected challenges. The main issue was weaving through the packs of walkers, picture takes, and casual joggers who weren’t expecting someone to come running by in a hurry. You also got a lot of odd looks since people were not expecting a race that day, but I didn’t mind that. One passerby even cheered me on. After leaving the promenade, you get to visit a less touristy area of Seaside, which was fun to see; it allowed you to enjoy the scenery without the crowds. The last ½ mile of Leg 10 is climbing the hill to the next exchange. This was a fun change since the rest of my legs were flat. The hill is lined with beautiful houses and trees and the challenge of the hill makes reaching the top feel that much more rewarding. Overall, I really enjoyed running leg 10. After seeing everyone else’s legs, I think I lucked out. First of all, I had beautiful views of both forests and the coast. Secondly, I was the only one who did not have to run on trail or sand, which is good for someone like me who prefers road running. My legs were also fairly flat, and though I personally enjoy more hills in my runs, it was a great opportunity to push my speed. Overall, I really enjoyed the scenic and stress fee aspects of being the 4th runner in the rotation. Great views of the ocean await you at the Gorgeous Coast Relay. Leg 11 – 5.3 miles – Seaside – (Mike) I loved leg 11. It was 100% trail as advertised (potentially overwarned – it’s not like I had to do any bouldering). This leg started at the trailhead and basically the beginning of a climb. I walked a bit on the up and more at some of the steeper downs. It was a beautiful trail with amazing views (and the option for various stopping points to overlook the water and have some photo opportunities). I felt there was a very limited ability to get lost although I’m sure you could if you tried. I ran on a dry day but trail was certainly wet and there was multiple times where my shoes sank through the mud past my socks. There were some slippery rocks, lots of tree roots, incline changes, and turns which made it a technical run and certainly not one you can run at your 10K pace. The only thing I didn’t like was some sections had boards on the trail to supposedly improve footing and making it easier to hike but they were definitely slippery and just created another hazard to be aware of. And did I mention I saw a coyote? Pretty cool. Leg 12 – 2.42 miles – Seaside – (Marc) This was an interesting leg. 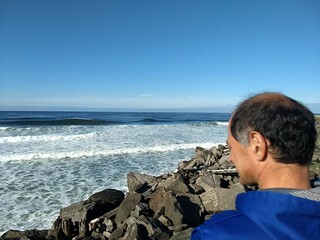 We met our Leg 11 runner inside Ecola State park where we had to purchase a five dollar day pass. As we waited for our runner we had time to use the outhouse inside the park. As our runner finished we had to go back to our van and then drive out of the park to drop me off at another trailhead, due to a damaged and dangerous connector trail that has been this way since last year. Now, I am an ultra runner and I love trail running. The first part of my leg was on trail and it was fun to be out and away from traffic. The trail was muddy in sections and there are many roots so if you are not experienced in trail running or don’t feel comfortable running on this type of terrain there will be some walking involved. I was told by a volunteer as I entered the trail there would be another volunteer at the top of the trail that would tell me directions. When I got to the top and hit a Y in the trails there was no one there and no flagging … luckily I am used to running trail so I took what looked liked the most used trail and continued on. As I left the trail it spilled out back onto the entrance road to Ecola State park and I made a right and headed down hill towards Cannon Beach. With a few turns through the local neighborhood I saw my team near the finish and we ran in together. We were the first team to finish the relay even though we were in the last starting wave. I credit this to all of my teammates’ strong running abilities and our previous experience in doing relays. The entire team then headed to Public Coast Brewing where the Gorgeous Relay had a section reserved for the finishing teams. Since the weather was nice we opted to sit outside so we could cheer on the teams as they finished running right by our table. The food and drink were good and we were able to drive back to Portland and be home in order to get a good rest. The 2019 Gorgeous Coast Relay will be on Sunday, October 6. (This year’s race was on a Saturday, next year it will be on a Sunday.) You can get more information about the race here, and note that registration opens at 5a on Tuesday, October 30. For 72 hours, the price for a 5-6 person team is $459, and starting on 11/2, the price for a 5-6 person team is $540. There are different prices listed for those teams with 3-4 or 1-2 people, as well.